Design is a Premium and the Best Free WordPress Theme which was listed as one of the most Popular WordPress Themes at WordPress.org. 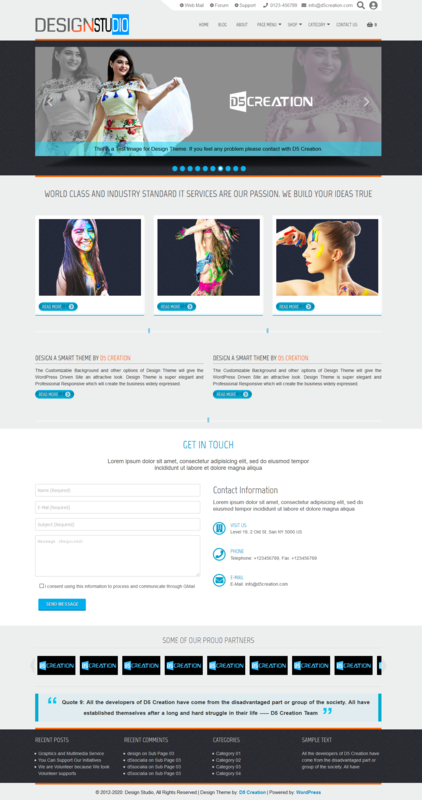 Design is super elegant and Professional Responsive WordPress Theme. This Theme has been developed with CSS3 and HTML5. Design is for Smart Companies and Persons who love to innovate. Customizable Background and Them Options will give the WordPress Driven Site an attractive look. Right and Footer Sidebar will be usable for showing the widgets. Full Wide page can be used for showing showcase or other pages. This Theme has more than 100 Options which will give you the opportunity to customize almost all the features of this Theme with extra functionality. D5 Creation's Support will be with you, Always! Extend Version has More Theme Features which will give freedom to the developers and the theme will be a frame of a complete CMS. Featured Images and Post Titles can be shown as sliding images easily in this special version. Users will take the decision which Featured Images and Posts can be shown as Sliding. DEVELOPER and ONE THEME Members can completely disable the Comments Box, Logged In User Admin Bar, Creditline if want. This Version can show the Site Logo or Company Logo and Site Link in the Login Page instead of WordPress Logo and Link. Log In and Menbership Registration are also available in this Theme Version. More Features will be added soon.